The Capital Allocation Line or CAL is the tangent line from the risk-free rate of return (on the y-axis) to the efficient frontier for risky assets. The points on this line represent the highest expected return we can get at a given level of risk when we have access to a risk-free asset. The risk-free rate will be assumed to be 3%, and the target return will be set to 14%. 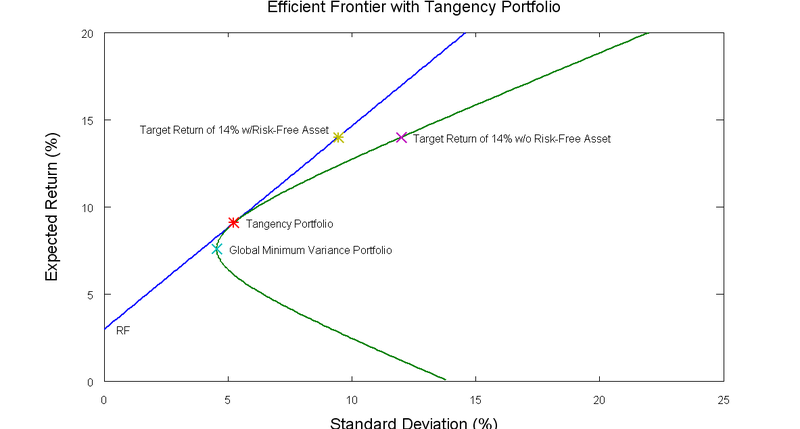 If we implement the equations for the tangency portfolio and CAL in Octave, we can calculate the portfolio weights for the tangency portfolio ( ), and the weight of the total portfolio which should be in the tangency portfolio ( ) and the risk-free asset ( ) to achieve the target expected return. Since this value is greater than 1, that means we have a short position in the risk-free asset with a weight of or -0.804. Note that this is a somewhat unrealistic scenario since we cannot borrow at the true risk-free rate. In practice our borrowing rate would be higher, and the actual risk-free rate would be used only for portfolios where we had a positive weight in the risk-free asset. This Octave code will calculate and plot the efficient frontier, tangency portfolio and the CAL. The script can be modified for a different set of assets by updating the expected returns vector, the covariance matrix, the target return, and the risk free rate. The script will also work in Matlab. Fantastic article series. As Frontcon (MatLab) is not implemented in Octave, these pages has been great inspiration. I have two questions. I would like to use this approach for a portfolio optimisation problem. But I need to evaluate on daily returns and stdev over daily returns (and in decimals instead of % – as in 0.10 instead of 10% etc.). I’m not sure how to do this trick. ( like transforming daily Sharpe to yearly with Yearly sharpe = Daily sharpe * sqrt(252)) – 252 trading days. Also how do you add constraints, eg. no short positions (negative weight). ? As long as the horizon (daily, monthly, yearly, etc) is consistent for both the expected return vector and the covariance matrix the program should still work. You should be able to do this with daily returns without any changes, and it should work with decimals returns….again as long as everything is consistent. The constraints problem is trickier. I don’t know of any non-iterative way to do the constrained optimization…i.e. I don’t think there is an easy modification you can make to the linear algebra equations. Instead I think you need to use some kind of iterative optimization technique. This looks very useful, thanks! I seem to have a problem running this with my data, in particular I often get very small numbers in my covariance matrix (sometimes it’s singular) and the efficient frontier doesn’t look right. If my assets are absolute weekly index prices am I correct in thinking that my expected returns are just the mean relative value of each index? E.g. I have zbar = [1.2; 13.51; 0.06; 0.88; 2.52]. And the covariance matrix is just cov(data) with data being the matrix of absolute prices, with each column being an asset, and each row a week? I’m not sure what I’m doing wrong, any help is appreciated.